We’d love your help. 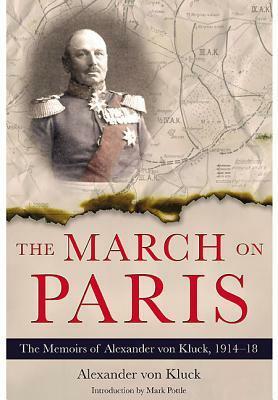 Let us know what’s wrong with this preview of The March on Paris by Alexander Von Kluck. To ask other readers questions about The March on Paris, please sign up. The Schlieffen Plan has always struck me as a plan gone wrong. The idea in 1914 was for the German armies to outflank Paris to the west, and then to envelop and surround the city. That didn't happen. Instead, just outside of Paris, the extreme right wing headed south to the Marne and passed Paris to the east. That cost the Germans a quick victory and condemned all sides to slugging it out in trench warfare on the Western Front. I have always wondered why that happened. This book goes a long way t The Schlieffen Plan has always struck me as a plan gone wrong. The idea in 1914 was for the German armies to outflank Paris to the west, and then to envelop and surround the city. That didn't happen. Instead, just outside of Paris, the extreme right wing headed south to the Marne and passed Paris to the east. That cost the Germans a quick victory and condemned all sides to slugging it out in trench warfare on the Western Front. I have always wondered why that happened. This book goes a long way to answering my question. Alexander von Kluck was the commander of the German First Army in 1914. This was the unit tasked with acting as the extreme right wing of the German invasion. After a reasonably good start crossing the border and advancing through Belgium, things started to go wrong. Prior to the invasion, the right wing was depleted by a couple of divisions transferred to the Russian Front. This left the First Army responsible for screening Antwerp, which didn't capitulate quite as quickly as planned, and responsible for securing the ever growing lines of communication. The tip of the spear had become diminished before the key engagements outside of Paris. It was also the case that the left flank of the German operations hadn't achieved their allocated tasks in the invasion. They were held up and delayed in Alsace and outside of Verdun. The plan was for the German line to shuffle eastwards along the Marne, but this didn't happen owing to the German Fourth, Fifth, and Sixth Armies failing to make progress along the German left flank. Von Kluck is very bitter about this in his memoirs. He argues, with some justification, that had the left flank made the progress that matched the right flank, the whole German line would have been extended much further to the west, allowing him to envelop Paris from the west. There is some self-justification that is hard to accept. The French, realising that the Germans were bogged down in Alsace and outside of Verdun, moved a whole army from their right flank to their left. The French Sixth Army appears to have assembled outside of Paris with von Kluck being unaware of it. No matter how he tries to present it, this is something of a reconnaissance failure. It allowed the French to threaten von Kluck's right flank. As he moved westwards to meet this threat, that exposed his left flank and opened a gap between the German First and Second armies. The BEF pushed into this gap as their contribution to the First Battle of the Marne. I think that von Kluck is right to complain about the lack of a consistent higher command. At various points, he was allowed operational independence and also placed under the command of the German Second Army. There was a continual question about under which command Marwitz's Cavalry Corps fell, which had the effect of creating an undue degree of uncertainty over the resources which von Kluck could command. I agree with his assessment that German High Command would have been better served by placing the First, Second, and Third Armies under a single overall command. I quite liked the book. It answered one of the questions that has troubled me for a few years. It seems that the German invasion of France in 1914 failed because of a reasonably inept high command, probably at the level of the Kaiser. It didn't end well for him. Thank goodness! My review will be relatively short as "Stephen" has given an excellent summary of the book and battle. Having just finished the book, but read several others on the topic, I will add to "Stephen's" summary. Yes, Von Kluck's apparent frustration with high command (Von Moltke) is evident throughout the book. In fact the Supreme Command, Von Moltke and staff, were hundreds of miles away in a chateau with the Kaiser- Von Moltke has been accused by historians of lacking the leadership necessary to co My review will be relatively short as "Stephen" has given an excellent summary of the book and battle. Having just finished the book, but read several others on the topic, I will add to "Stephen's" summary. Furthermore, as "Stephen" states Von Kluck's Army was weakened by removal of divisions for an initially stubborn Russia,Belgium, and against Von Schlieffen's deathbed wish, Von Moltke weakened the right wing ( Von Kluck's 1st Army) by transferring divisions to the left wing and centre as he believed and somewhat rightly so, the French would want their revenge from the loss in 1870-72 of Alsace Lorraine. The other question answered in the book was why the famous "pivot" in front of Paris vs the "encircle" strategy as advocated by Von Schlieffen ? Von Kluck places the blame directly on "Supreme Command" stating that he received direct orders to follow Von Bulow's southeastern push and rather than hold territory, destroy the French army. As "Stephen" has stated, this left his right wing open to the army being attacked/encircled by the newly formed 6th Army under the French General Manoury. In the end, one of the major failures of the Von Schlieffen plan, and impact on Von Kluck was the tremendous distance his 1st Army had to literally walk, forage and fight - some 375-400 miles ! The French commander , General Joffre, meanwhile was working feverishly, travelling from front to front ( his driver was a former race car driver) sacking ineffective generals, transferring divisons wholesale from his right wing to the left, leading an effective withdrawal, and keeping a finicky British Marshall French engaged. In the end, Joffre waited until the German supply line was at breaking point and ordered a major counterattack across the whole front. Thus ended the Battle of the Marne and the war entered a new phase and one we now know so well - the battle of attrition and the trenches. In summary, the book is a good read for people who enjoy the details of battle, but one doesn't get a good idea of Von Kluck's thinking or reasoning. Also, it is also advisable to have a very detailed map of France beside you as you read - the various villages, towns and rivers mentioned by Von Kluck will have you confused about the advances and ultimate retreat of his Army. Having travelled through northern France following my (Canadian) Grandfather who fought there in 1918, I can attest to the large number of tiny hamlets/villages which dot the landscape.